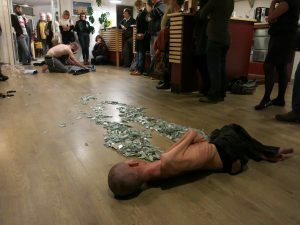 The ‘Kamcel’ project born in 2014 from the meeting of two performance artists, with obviously different bodies, one disabled and the second fit. 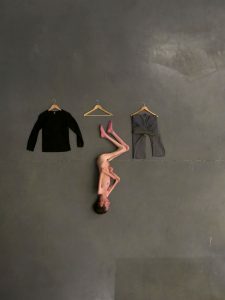 Using this physical gap in performance situations, the two men try to wonder about limit notions and communication between the bodies: How starting from objects or actions the other can appropriate? What is created between? The first idea of the project is to create a performance dialogue between Kamil Guenatri’s imaginary and embodypossibilities of Marcel Sparmann. Situations come mostly from the indicated rough books before.These being vast and varied, performances would be realized in different contexts: public/private, inside/outside, in turn/together… etc. From each situation will be produced a photo performance and the collection would form a visual book, final outcome of the project. This book will also include project questioning with a special page layout that will show the back and forth between both bodies.